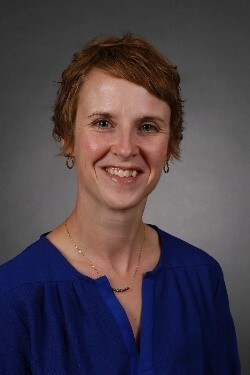 My name is Erin Cortus and I am a new faculty member in the Bioproducts and Biosystems Engineering Department at the University of Minnesota. My role is to provide engineering expertise in the area of sustainable animal agriculture systems. Through Extension and research, I work with producers and community members to understand and continually improve the environments in which we raise livestock. What is a sustainable animal agriculture system? The answer depends on many things, and that is what makes my job both exciting and challenging. At the heart of most agriculture sustainability definitions you find the following question: What are the current social, economic and environmental considerations that allow a system to continue to produce food, fuel and fiber for future generations? This goal seems simple enough, but we also have to consider the following. Every farm, company and industry has unique social, economic and environmental considerations. Ultimately, we can all be working towards sustainability, but the definition of what that looks like may differ. These broad areas of society, economics and environment are measured by very different means. How do we consider these unique aspects simultaneously? In order to meet the needs of future generations, we need to make some predictions of what is to come (or be overcome). There are standards and fields of study devoted to sustainability definitions and processes (see Resources). Agricultural industries and researchers have offered definitions, evaluations and products to align and help the industry and individual producers. I discuss some of these evaluations and products for the swine industry in this article. The “sustainability” conversation is something many of you are already having. It is important to continue these conversations with ourselves, within our industry and with the broader community that includes neighbors and consumers. Regardless of how in-depth your knowledge of the “sustainability” science is, I am offering suggestions on how can we enhance this conversation. My suggestions focus on the Environment domain (see Figure), but parallels can often be drawn for the Social and Economic domains as well. From the planning stages to the day-to-day management of a farm, livestock producers are continuously making decisions. Decisions are influenced by our knowledge, experience, surroundings and values. When it comes to decisions that affect the environment, some decisions are further influenced by rules or standards (i.e. CAFO permit stipulations). Other times, decisions are based on the best available science, preferences, economics or simply the norm. Environmental stewardship is taking responsibility for one’s decisions. This involves understanding the environmental risks associated with situations or practices on a farm. Environmental risk can be decreased by eliminating or reducing discharges to water or air and maintaining a balance of nutrients entering and leaving the farm. Environmental stewardship also means following the rules and considering neighbors and the environment in each decision. How do we include environmental responsibility in our conversations about sustainability? Is the conversation enhanced if we include decision factors and responsibility for both accomplishments and shortcomings? Sustainability is more of a continuous path versus a final destination. The only firm fixture we have is where we are or have been. As mentioned earlier, the definition of what sustainable looks like is made by an individual, farm, industry, or enterprise. We add credibility and power to a definition when we also have Key Performance Indicators (KPIs) of success, and ways to measure these indicators (metrics). The stronger these indicators are, the firmer foothold we have to understand and track progress. Just like a footprint in the sand demonstrates the physical presence a person, animal or thing has on that small patch of ground, an environmental footprint is a measure of the effect someone or something has on our air, soil, and water resources. Over many years, the National Pork Board has brought together multiple research projects to both measure the carbon, water and land use used to produce pork that, collectively, make up the US swine industry’s environmental footprint. The 2014 US swine herd carbon footprint was 2.87 pounds of carbon dioxide equivalent per pound of live weight of pigs at the farm gate. Similarly, the water footprint was 18.7 gallons of water per pound of live weight of pigs at the farm gate. Footprints are one useful method to evaluate environmental impact. Free and online tools like the Pig Production Environmental Footprint Calculator (see Resources) help individual producers make these complex calculations specific to their own farm and conditions. Individual producer footprints may be higher or lower than the 2014 US herd baselines, but they indicate a farm’s current position as a reference point for the future. There are other metrics that farmers already track that add to the discussion. Regular soil and manure samples, for example, are critical for nutrient management planning and efficient use of manure as a fertilizer. What else can long term soil samples show? Are soil nutrients, properties, or organic matter changing over time because of manure additions? Are the current levels and changes helpful or detrimental to long-term productivity by the land? Finally, when we consider these different metrics, how do we prioritize? What processes or parts of a system can a producer exert influence or control over? For swine production, a producer has some influence on feed source and feed stuffs, and feed decisions impact carbon, water and land use in varying ways. Lighting is typically a farm-based decision, and influences energy and carbon use, but has little impact on water and land use. We recognize the impact of our decisions extends beyond our farmgate, and that we are also a victim of circumstance. We can evaluate where we are now, but does this current path work in the future? There are a lot of external forces that we have little to no control over that impact options and decision making. Some examples that could slowly or quickly change an environmental footprint: climate variability including severe droughts or floods, economic crashes, disease outbreaks, new genetics. Researchers use models to predict what might happen when some external factors change. For example, anyone can use the Pig Production Environmental Footprint Calculator to run a simulation with the historical weather files for any county in the US. The program designers and those familiar with the software program could also run the same calculations assuming a five-year drought period. In this theoretical example, some factors would likely fluctuate widely, like irrigation usage, and other factors would not, like energy use for lighting. Model results can indicate how sensitive the farm is to changes in these outside forces. Once again, there are scientific, statistical and mathematical based approaches to evaluate future risks. However, simply stopping to have the “what if” conversation is a good starting point. This “what if” conversation can also help us evaluate potential changes. If and how will changing the lights, pig diet, or adding solar panels affect the environmental footprint collectively? Having a personalized definition of sustainability is a good start when having conversations about sustainability. What environmental, economic and social factors affect my farm’s ability to be productive for generations to come? The following are some suggestions and questions to pose to enhance your internal and external conversations about environmental sustainability. Promote the why you are doing something, and support with the proof by how you are doing something. What factors were considered in a decision that affects environmental stewardship? Is there any internal or external oversight to my actions or management? Recognize shortcomings in a decision– what would tip the decision? New technologies, more people, less time, etc. Is this an opportunity to leverage external support for your future plans? External support can come in many forms, including social acceptance and monetary or technical support. Set baselines through a footprint calculation, history, or even speculation. Your metrics are your metrics and they can help you chart your course. Be less concerned with sharing the values, and more concerned with sharing how you are using them. Look to the future, recognize that common goals can be achieved following multiple pathways. What pathway makes the most sense for your operation and priorities? On a personal note, during an exam in 2004, my advisor asked me to assess the sustainability of Saskatchewan pork production systems. I passed the exam, but experience has definitely strengthened my view of this challenging topic over the years. I look toward to continuing the conversation in the future. 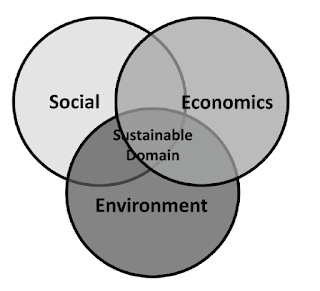 The three dimensions of sustainability key performance indicators (from ANSI/ASABE S629). ANSI/ASABE S629. Framework to Evaluate the Sustainability of Agricultural Production Systems. Dr. Erin Cortus is an assistant professor in the Bioproducts & Biosystems Engineering Department at the University of Minnesota. She can be reached at ecortus@umn.edu.